Holy Cannoli! Just kidding… The cannoli is good but not that great; I just wanted an excuse to say, “Holy cannoli!” In any case, I am really kicking myself for having my very first cannoli at Veniero’s in New York last year. Veniero’s Pastry Shop is known to serve the best cannoli in New York. 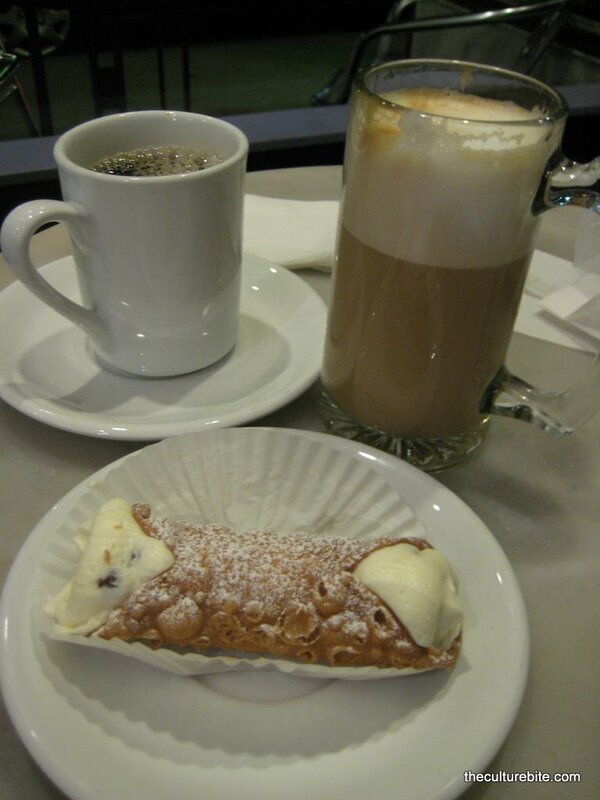 AND, since New York has such a strong Italian community, the cannoli has to be amazing. Any, shall I say, cannolo, I eat here on out, I will always compare to my very first taste of the creamy, sweet ricotta filling wrapped in a crispy pastry dough. K and I came late one night after a dinner date at Colloseo. I love that they are open till midnight on Fridays and Saturdays. Stella’s is a tiny cafe serving Italian treats such as the famous cannoli, the classic napoleon or the original Sacripantina which is a layered vanilla sponge cake with custard, sweet butter, marsala, sherry wine, cream and rum. I haven’t had a chance to try this yet, but I hear it’s to die for. We were full from dinner, so all we had room for was one plain cannolo. I’ll start with the filling. The ricotta cream was very smooth and creamy. The bits of chocolate chunks added some texture. My only complaint about this cannolo is the crust. It was a bit too hard than what I’m used to. You really had to bite down hard to break through the crispy pastry shell, and once you did, the entire cannolo collapses because of the force. In conclusion, the taste is all there, they just need to work on the texture. I’m definitely coming back to try Stella’s specialty Sacripantina cake. Stay tuned for an updated post.